A WONDERFUL GIFT IDEA FOR FAMILY , FRIENDS OR YOURSELF. 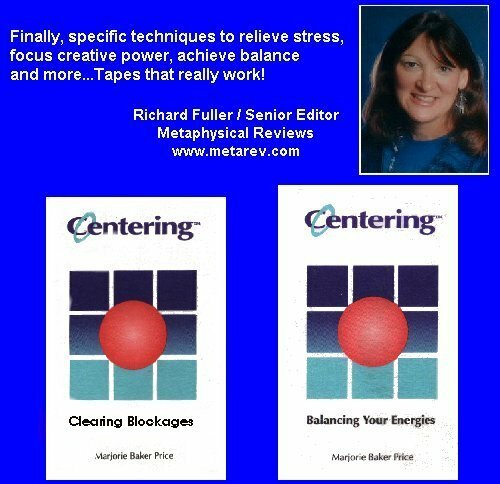 Here are two very special self-hypnosis tapes that help you clear blockages and balance your energies. Regular listening will continue to rebalance, release and clear physical and emotional blockages. Powerful visualizations bring you boundless, indestructible, unconditional love, light and energy. Transformational self-hypnosis techniques will balance, harmonize and integrate all parts of your being. You will feel relaxed and energized. Marjorie Baker Price is an RN, and is the author of the nationally acclaimed Centering Tools audio tape series for emotional, spiritual and physical well-being and balance. She can help you build a foundation for personal power. Buyer please include $3.85 priority shipping and handling in the United States. Any questions please contact me at Marjorie@centeringtools.com.